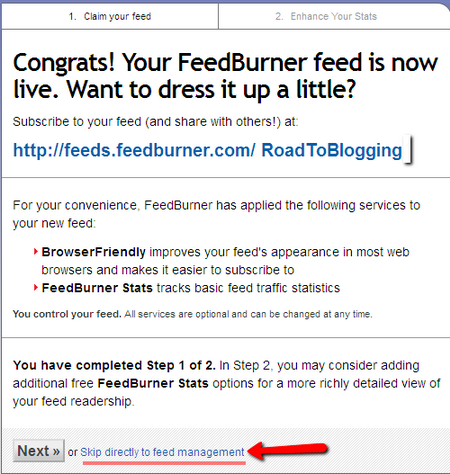 Whenever you launch a new blog, one of the essential things to do is setting up FeedBurner. 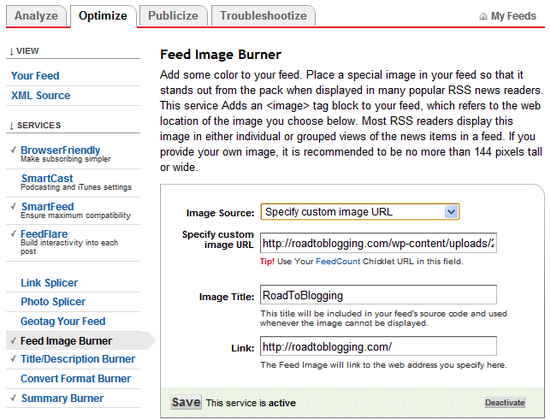 It’s very easy to burn your RSS feed with FeedBurner. Most important feature of the FeedBurner is free email subscription. For example if any of your reader subscribes on your Feed, FeedBurner will send your latest feed to his/her email. So it always better to have RSS feed for your own blog. WordPress has a built-in feed. But Feedburner is better than that as you can optimize FeedBurner easily. In this post I will show you how to set up FeedBurner and how to optimize it for WordPress Blog. So Why You Should Use FeedBurner? It’s free and owned by Google. It sends your new Feed directly to your subscribers’ email. Once you’ve set up it you don’t need to do anything further. It helps you to get quick indexed by Search Engines. It offers various feed reading services. 1. At first Go to FeedBurner. 2. Sign in with your Gmail Account. If you don’t have any, create it NOW. In the first step, you will have to submit your Blog Feed URL on the box. (Follow Screenshot). Most of the time Feed URL is http://yourblog.com/feed. For my blog, it is https://roadtoblogging.com/feed. 2. In the next step it will ask for Feed Title and Feed Address. It is better to keep the Feed Title as same as your domain name. For address, you can also use your domain name. Just click ‘Skip directly to feed management’. That’s it. You’re Done. Your Feed is live now. Once you’ve set up your Feed Burner, now time to optimize it for better result. There are not much to do in Analyze setting. Just make sure that you’ve clicked all the ‘Configure Stats’ to get all data. Just click on Save button. First step on this setting is to make sure that your BrowserFriendly option is activated. To make your Feed compatible with any Feed reader application, active SmartFeed. FeedFlare places simple share & Email buttons. I am using Emil This, Share on Facebook and Stumble It. Actually by default they offer these button. So I think you can go with default setting. You can skip next three options – Link Splicer, Photo Splicer, Geotag Your Feed. I don’t think you have to do anything with that options. Title/Description Burner – Give Proper Title and Description of your Feed. You can use your Site’s Meta Description as Description. Summary Burner lets you to show the excerpt of your post. You can limit the maximum length. Now lets move to the Publicize Setting. BuzzBoost is RSS widget that lets you add your latest post link on your site or another site manages by you. Once you active this option they will provide a code. Just copy and paste the code in you desire place. Email Subscription is the most important part. It will send your feed to your subscribed readers. Feedburner offers a simple Email sign up form for your website. But you can other WordPress Sign Form Plugin. Pingshot is a ping services. It’s not much important. FeedCount lets show the number of your total subscriber. It is another cool way to promote your feed. Socialize will tweet your new feed whenever you publish it. So these are the important settings for Publicize. Your FeedBurner is ready. Now time to integrate it with your WordPress Blog. By default your blog feed link is yourdomain.com/feed. You have to redirect that to the FeedBurner link. Many WordPress theme has that option. If your theme doesn’t offer that option then use the plugin FD FeedBurner. Once you’ve installed that plugin. Go to Setting > Feedburner. Put your Feed Link on “ Redirect my feeds here”. That’s it. Your Feed is now integrated with your WordPress Blog. Do let us know if you face any difficulties. If you want to get the updates of Road To Blogging dot Com, then subscribe in our Email Subscription. And consider sharing this post with your friends. Quite impressive tut… I have done all the feedburner settings but can you tell me how I can embed the comment subcription or email subscription into my website. hope for an early reply ! I love the breakdown here. All of my blogs are burned through FB. Easy and quick way to reach your readers in an intimate way, with your latest posts flowing directly into their email inbox. Good to know that you loved it. Yeah FB is the best medium to connect with readers as it requires only one click. But some people want to have updates in their mail box.